YouTube/Sainsbury’sASA recognises some people may find the Sainsbury’s ad ‘Distasteful,’ but it is not investigating the spot. 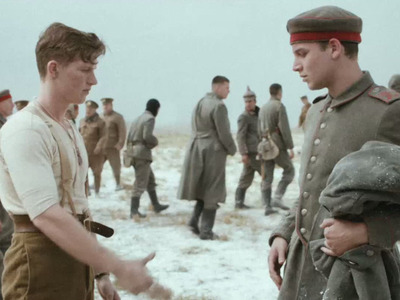 The UK’s advertising regulator has not found grounds to investigate this year’s Christmas ad from supermarket Sainsbury’s, despite the commercial sparking 727 complaints claiming it was “offensive” because it uses a World War I tale to promote the brand, and separate allegations that it was “misleading” because it was not clear from the outset that the spot was an ad. The ad, created by agency AMV BBDO, depicts the remarkable true story of real events that took place on Christmas day 1914, when troops on both sides of the conflict downed their weapons, emerged form their trenches and exchanged seasonal songs and gifts. The two armies also played friendly games of football to mark the festive occasion, an image also featured in the ad. The Advertising Standards Authority assessed the complaints received, but has decided there are not grounds for investigation and is closing the case. Alongside the TV campaign, Sainsbury’s has partnered with the Royal British Legion to sell the vintage-looking chocolate bar that appears in the ad in stores for £1, with 50p of each purchase going to the charity. Sainsbury’s told Marketing Week earlier this month that it was selling 5,000 of the chocolate bars every hour. However, there are also swathes of users praising the ad in the YouTube comments.